A flotilla of the Iranian Navy warships has left the country’s southern port of Bandar Abbas to conduct “routine missions” and project power in international waters, particularly in the Gulf of Aden the Iranian media reported. The Navy’s 50th fleet comprises Shaheed Naqdi and Bayandor destroyers and a logostic combat warship called Tonb. Rear Admiral Afshin Tashk, the commander of Moqaddam Naval Base, said the naval deployment will display the Iranian Navy’s “high capabilities” and stressed that the country’s naval force needs to have presence in the high seas in order to be strategically effective. The fleet will also seek to “counter efforts to spread Iranophobia”, gain regional intelligence and cooperate with naval forces of other regional countries. 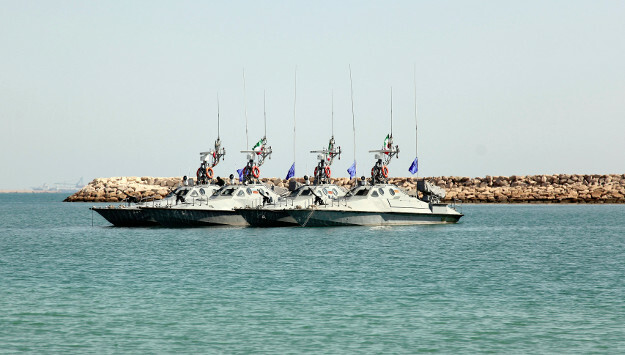 The Iranian Navy has been conducting patrols in the Gulf of Aden since 2008, according to the Iranian press. Comment: The Islamic Republic has in recent years made it a priority to develop its naval capabilities, although its leaders often exaggerate the country’s progress in building advanced naval assets and expanding its naval forces’ presence in international waters. Last year, Iranian Navy Commander Rear Admiral Habibollah Sayyari said the country’s Navy has taken steps to enhance its capabilities and will expand its presence in international waters in the future. “In the year 96 [new Iranian calendar year that begins on March 21), we will take greater strides to enhance the capabilities of the naval forces,” he said during a tour of Khoramshahr Naval Base in southwestern Iran. “We will increase our presence in international waters, expand the zone of our naval drills, increase the production of [naval] equipment, and pay more attention to training programs,” he added. He further boasted the “Global Arrogance” – a term Iranian leaders use for the United States – has failed to prevent Iran from developing its military power. Last year, the Iranian Navy also announced that it was manufacturing several warships and submarines. Iran’s Supreme Leader Ali Khamenei has called on the country’s military leaders to expand the country’s naval capabilities. In a meeting with senior Navy commanders in Tehran, Khamenei said the Navy should boost its assets and capabilities both in terms of military gear and combat power. The Supreme Leader particularly emphasized the need to expand the Navy’s operations in “critical regions” such as the coast of Makran, and the Gulf of Oman, and urged the Navy to maintain presence in international waters. The Iranian naval expansion efforts comes amid increasing concern raised by the United States and regional countries about Iran’s “irresponsible” naval activities in the Gulf region. The Saudi-led coalition says Iran sends weapons shipments to the Houthi rebel movements. And in November 2016, the chief of staff of the Iranian armed forces, General Mohammad Hossein Baqeri, triggered alarm in the region after he said Iran sought to set up naval bases in Yemen and Syria. U.S. naval officials also repeatedly complain about Iran’s hostile maritime actions that disrupt international navigation in the Persian Gulf. They have also warned that Iran’s provocative naval maneuvers increase the chance of miscalculation and unintended confrontation in the Gulf region.